Learn how TFP’s Value Selling Practice can help you present your solution in terms that resonate with financial buyers to help you win the most deals at the highest possible value. 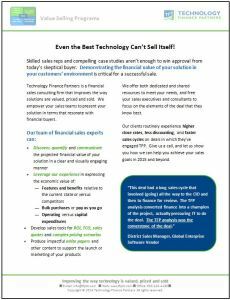 Field-level ROI support enables leading enterprise technology cost-effectively leverage the skills and experience of dedicated ROI experts to improve sales outcomes. Learn how TFP’s Field-Level ROI Support program helps its clients improve their close rates, increase their average deal size, and expedite sales cycles. 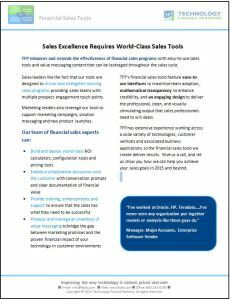 Learn how TFP enhances and extends the effectiveness of financial sales programs with easy to use Financial Sales Tools and value messaging content that can be leveraged throughout the sales cycle. 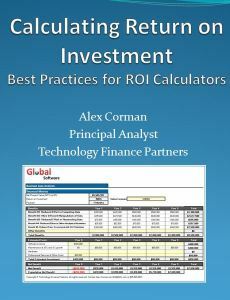 In an update to the popular white paper, the author discusses the value of producing a business case analysis (also known as an ROI analysis or a CBA) to support a technology investment or for technology vendors prove the value of their product in sales opportunities. The author provides step-by-step instructions for building a business case analysis and for calculating key financial metrics such as ROI, NPV and payback period, and documents best practices in the production of a business case analysis. TFP experts build business cases to support our clients’ most strategic sales opportunities. Learn some of our most valuable recommendations for building a persuasive business case. How do you demonstrate financial value without access to specific customer data? Some companies have partnered with TFP to build value messaging content based on representative data. See this sample product we built for Citrix GoToAssist that demonstrates how customers can see the potential financial impact of your products before divulging any information about their business. Learn how to leverage industry benchmarks to build an effective business case, as TFP’s Drew Wright speaks with Bruce Belfiore, CEO & Senior Research Analyst of BenchmarkPortal in this podcast. 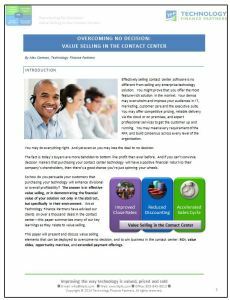 In this white paper, TFP presents value selling elements that can be deployed to overcome no decision and to win business in the contact center. Some of the strategies discussed are: demonstrating ROI, value slides, opportunity matrices, and extended payment offerings. Learn how to win more deals in the contact center with these best practices and suggestions. 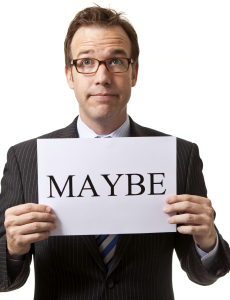 A re-play of the recent TFP / ROI4Sales webinar discussing best practices in overcoming “no decision” in sales opportunities.